There are several hiking trails at the Rockcastle River Wilderness Site. The most traveled trail is the Michael F. Zalla Trail (1.7 miles, moderate), or "Zalla Trail." 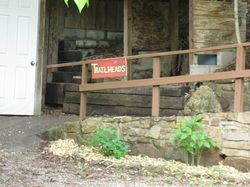 The booklet, which includes a trail map and information on geologic formations, plants, and ecosystems found along the trail, is available at the trail head below the Nature Center. There are also self- guided activities like "Can you find me?" to challenge you along the trails! We want to know what you find on the trails. We have designed several hiking activities to guide your adventure and increase your knowledge of the surrounding ecosystems. You can find these activities at the information kiosk under the Nature Center during operating hours or special events. Can you find me? is an activity about the woody plants and wildflowers found on the property. Several surveys have been done to identify the various flora and fauna. Challenge yourself to identify the plants and send us the results! Take pictures and send it to us: aspi@a-spi.org. We will post your results and enter you to win our identification contest!